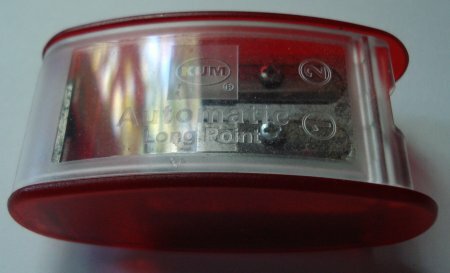 The Kum Automatic Longpoint Sharpener (Automatic Langkonus Spitzer in German) is definitely known on the net. It’s often touted as being one of the best sharpeners made today. After trying it myself, I felt that what I had previously read and heard didn’t really communicate how the Longpoint works. I doubt I’m alone, so with the help of a picture or two, I hope to clarify matters. The sharpener is an oval prism container, with two externally accessible holes. It comes with two spare blades tucked into a corner of the container. This is a very nice touch. I’ve never seen a spare sharpener blade for sale at an art supply store or stationer, and it’s nice to see a sharpener given a longer life with this addition. Let’s get to the sharpening method. The left hole has a exit diameter of about 2mm, which is the diameter of the pencil lead or core. Thus the blade catches and sharpens the wood of a standard pencil, but misses the core. (See photo.) The pencil is then placed in the second hole, where the lead gets sharpened to a very fine point. So when I saw this, all I thought was that this looks like the way pencils were sharpened a few years ago. Essentially, the angle of the point produced by sharpeners has been increasing over the years. If you like this very sharp point, and don’t mind the extra work of the dual sharpening, this may be the product for you. so turning a cylinder of lead into a cone of lead discards 2/3 of that lead. V = ? *1mm2*3mm = 9.4mm2 will result in 6.3mm2 discarded to create a 3.1mm2 point. A point which will be much harder to keep unbroken, by the way. A more modest 2mm long point would produce only 4.2mm2 of waste. The 2/3 of the lead discarded in making a point actually could be an argument in favour of mechanical pencils. I’m sticking with regular sharpeners, but it’s nice to know about this alternative.